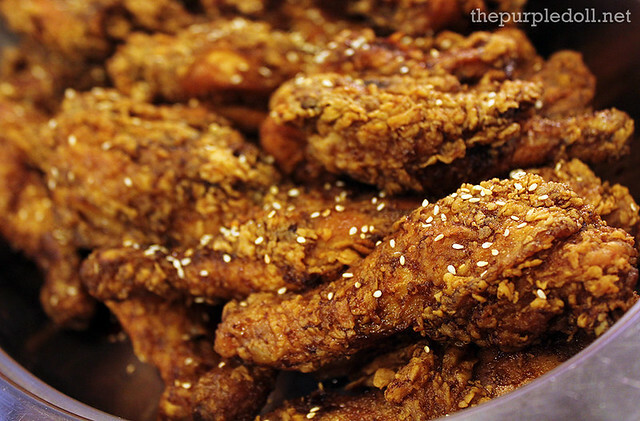 Who has yet to hear about the crispy and savory chicken treat which first made a name in Mercato Centrale? 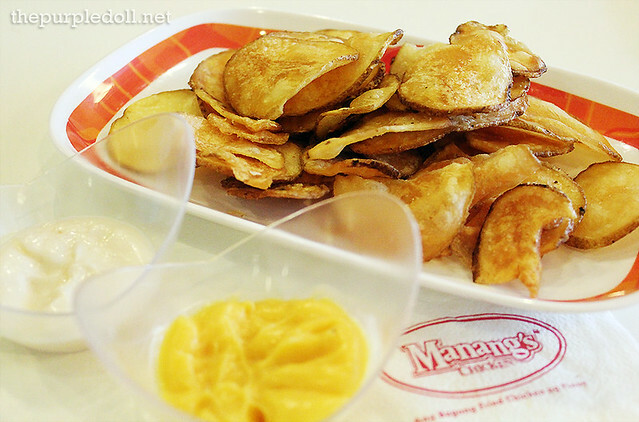 If you're a fellow foodie, I bet Manang's Chicken rings a bell. With roots still strongly and deeply planted in weekend markets, this up-and-coming chicken house expands to cater to diners in commercial areas. And with eight branches scattered all over the Metro, another store joins the roster as it opens its newest branch in Wilcon City Center, Visayas Avenue, Quezon City. 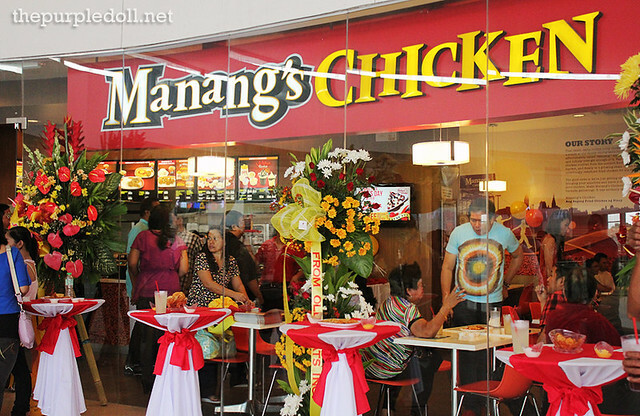 Manang's Chicken in Wilcon City Center, a new community mall and restaurant nest, opened last June 5. 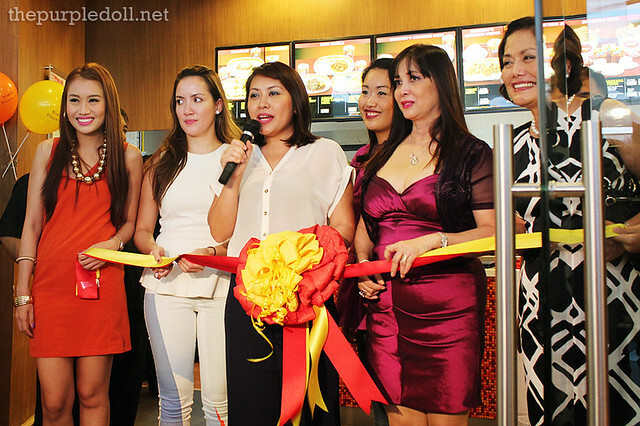 Although the owner's cook-mayordoma, the wonder behind the tasty chicken and whom the family affectionately called Manang, wasn't able to attend the opening ceremony, honorary guests together with Giabella Foods Corporation formally launched the new branch through a brief yet meaningful ribbon-cutting and blessing. With every restaurant opening comes food tasting. So after a few words from President Jill Gerodias-Borja, we're on to a feast -- Manang's Chicken style. Don't get me wrong, this isn't the first time I've tried the food from this chicken house. My first was at Mercato Centrale which I wasn't able to blog. However, the feeling was familiar as I still got excited to try the food offerings at Manang's. Call me a fatty, but Manang's Chips and Dip (Regular P39; Large P58) will still be a staple to my future visits in the restaurant. With a choice of garlic mayo or creamy cheese, these tasty potato chips fried to a golden crisp are one of the best potato chips I've had in my entire life. I've downed three servings and it was so hard to stop! There was also a generous serving of Manang's Chicken in Original Sauce dubbed as the bagong fried chicken ng Pinoy. These chicken cuts double deep-fried and coated with Manang's secret soy garlic sauce were as tasty as I remember them to be. 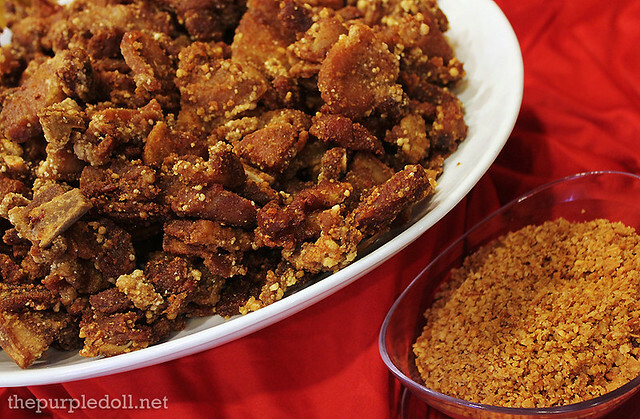 The crunchy skin oozes with sweet and savory flavors, while the meat is far from being dry. We also got to enjoy the Garlic Pork Liempo, deep-fried pork with garlic topping served with Manang's own vinegar dipping sauce. Being a pork and garlic lover, this dish definitely satisfied my cravings. Every bite on the crispy pork was sinfully good. 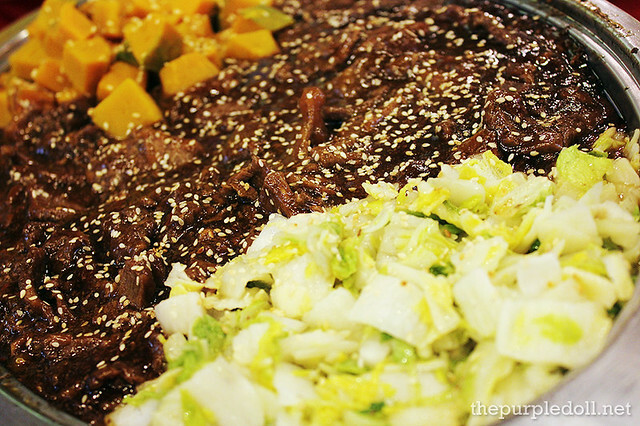 Next we had was another dish based on the family recipe -- Sesame Beef Stew. This viand with beef strips and fresh local vegetables in thick sesame sauce is probably one of my favorites from Manang's Chicken. The beef was cooked to a lovely tenderness, the vegetables were slightly crispy giving off a nice texture, and the sauce was just so tasty without being too overbearing, just the perfect blend of sweet and savory. 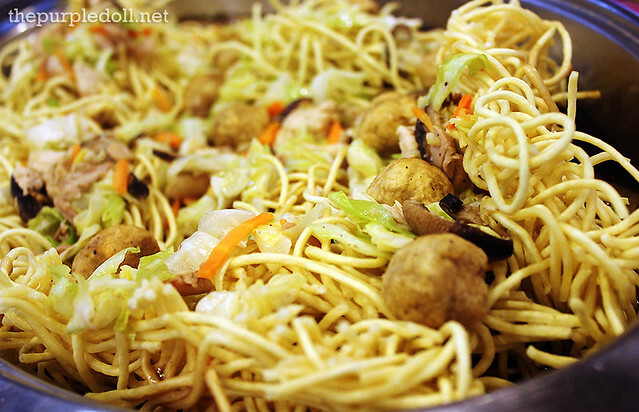 For carbs, I skipped the rice and went with the Fried Pansit (P85) -- a crowd favorite made up of deep-fried noodles topped with chicken, mushrooms, vegetables and Manang's secret sauce. Although I'm not big on noodles, I enjoyed the mix of savory and fresh healthy flavors of the dish, as well as munching on the crispy strands of canton. 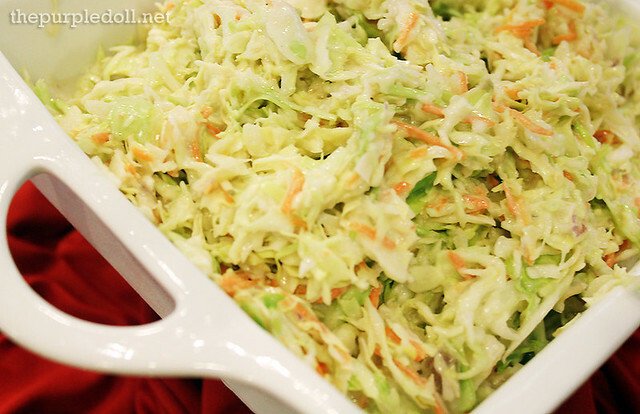 I'm not a big fan of cabbages, but I enjoyed the Coleslaw (P30) as it had fresh and crunchy, not wilted, veggies in a bright, slightly sweet, sour and creamy mayo dressing. 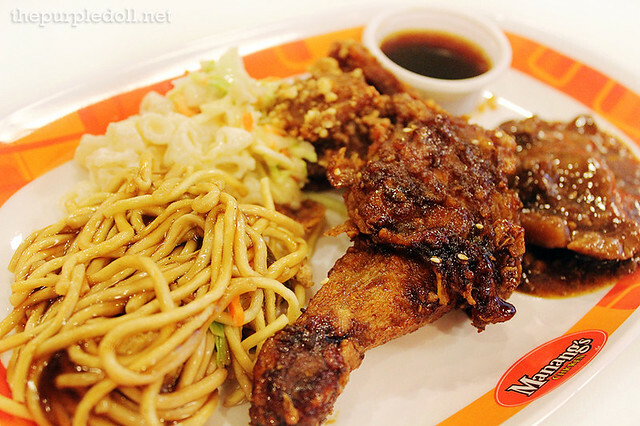 This is truly a great and refreshing find which I'll be ordering again at Manang's Chicken. We also got to try the Macaroni Salad (P30). 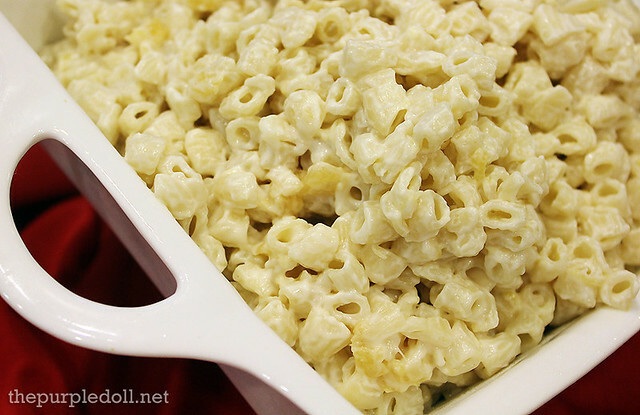 Like the coleslaw, this one also has a bright, sweet and sour, creamy dressing coating the perfectly-cooked macaroni treats. And although not a total head-turner, I still enjoyed munching my share. I'm used to eat a lot, but my platter of Manang's Chicken's offerings got me full. It might be the calories from this plate, or maybe the chips and iced tea servings I downed finally got the best of me. 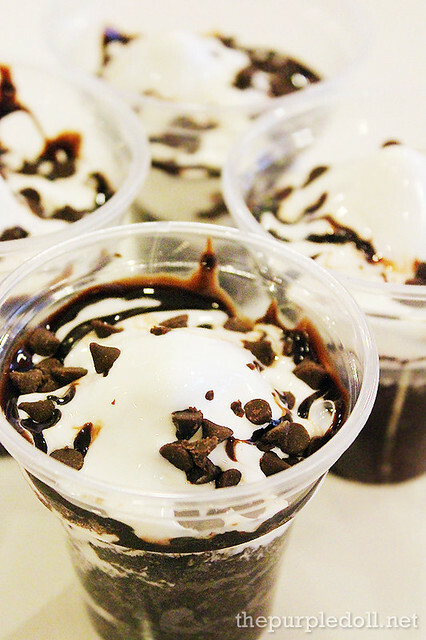 However, no matter how full I was, a meal won't be complete without a much-deserved sweet ending. Yes, desserts! Making this trip more memorable was the Velvet Sundae (P45), a symphony of warm and moist velvety cake of chocolate, fudge, vanilla ice cream and chocolate chips. This dessert is definitely a combination of my favorite sweet treats -- cake, ice cream and chocolate. You can eat this baby layer by layer, or mix it all together. If you're curious, I eat all the layers in a spoonful, but leave some cake to enjoy it on its own glory. With tons of chicken houses sprouting in the Metro, it's hard to spot which ones are good and which ones are not. Although this trip to Manang's Chicken was a brief one both to celebrate the opening of a new branch, and to sample some of the store's best-sellers, Manang's definitely left an impression. A good one to add at that. So even though my love for chicken dishes has been declining for the past few months, Manang's has the chips, sesame beef stew and velvet sundae I can go back for again and again and again. 2/F Unit 15 & 16, Wilcon City Center, Visayas Ave. But wait, there's more! Now that you know what I think of Manang's Chicken, here's a chance to try Ang Bagong Fried Chicken ng Pinoy and more of the restaurant's goodies for yourself as I'm giving away a P500 gift certificate to one lucky reader. 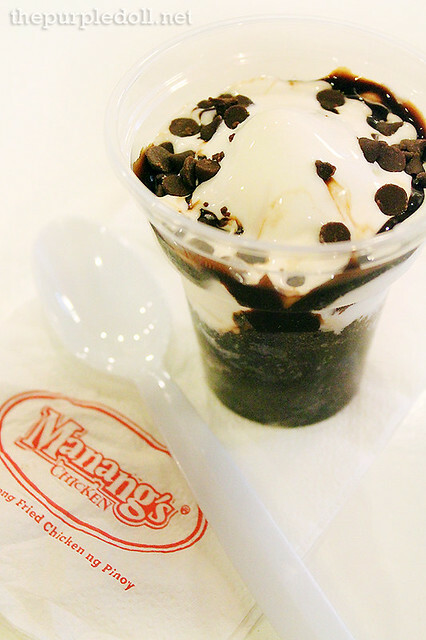 Prize: One P500-worth of Manang's Chicken gift certificate valid for food and drinks in all branches (Ortigas, Katipunan, Visayas Ave., Tomas Morato, SM North, SM Megamall, Taft Ave., Glorietta 4 and BF Homes Parañaque) until December 31, 2012. Be a Metro Manila resident or someone (even not within Metro Manila) who can actually use the prize, or have a person you'll give these prizes to in case you can't use them yourself. Like The Purple Doll, The Foodies Circle and Manang's Chicken pages. Make sure that you tag The Purple Doll and Manang's Chicken's pages, 3 of your friends, and have set your wall post public. Follow us on twitter by clicking the buttons below. The giveaway raffle will run from today until July 20, 11:59PM. The winners will be chosen via Random Picker and will be announced on July 22. So join now everyone and get a taste of Manang's Chicken, Ang Bagong Fried Chicken ng Pinoy. Disclaimer: Manang's Chicken GC was provided by the good folks from Manang's Chicken. Hi. I'd like to edit my comment because the previous one had typo error. I love this game :) I'll definitely tell my friends about this!!! Zark's Burgers: It's Jawbreaker Day!